Every girl needs a “WOW” skirt. It should offer the flexibility to be dressed up or down depending on your mood while still maintaining its”wow” factor. I’ve owned multiple skirts that were nice and looked good but nothing that I was in-love with. 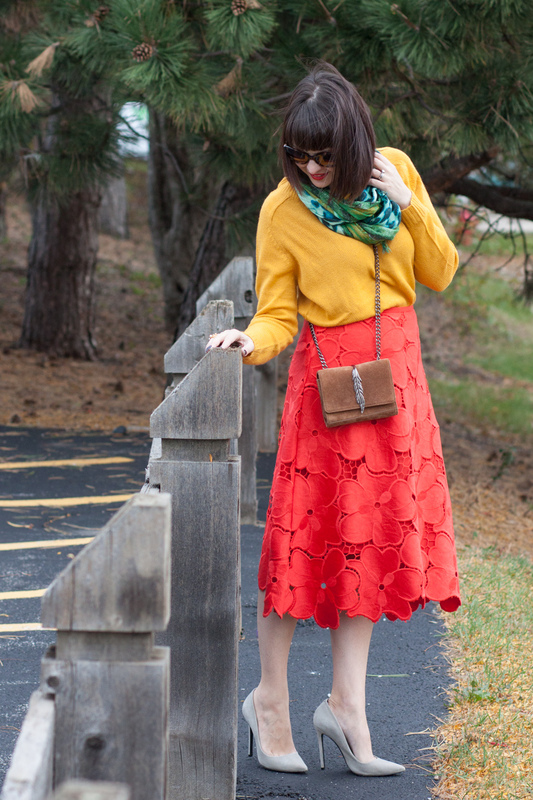 That changed when I saw this Anthropologie skirt! It has everything that I adore – bold color, unusual texture and flattering style. The skirt’s fabric is quite heavy so it’s perfect for colder weather, too. I immediately went into crazy color mixing here. But it can just as easily be paired with a black turtleneck and boots for a more elegant and refined look. You can probably even wear it with a cropped navy blazer if you are looking for a more structured outfit. Like any other great piece, the skirt will adjust to your wardrobe and style.